Mr Kalsaria, who had joined the Arvind Kejriwal-led party in 2014, said that although he has not formally resigned from AAP, he will not work for it during the polls. 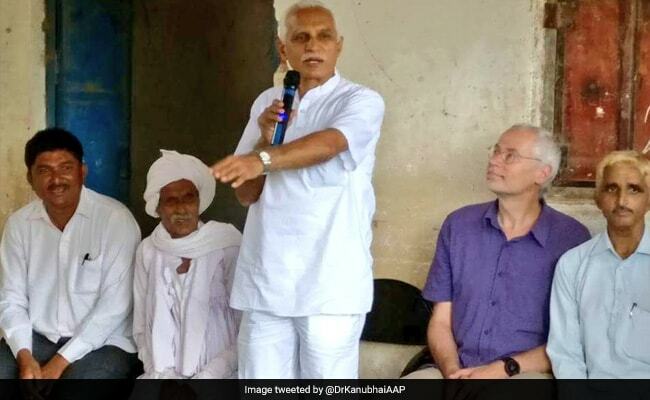 Ahmedabad: AAP leader from Gujarat, Kanu Kalsaria, today announced that he will fight the next month's state assembly polls as an independent candidate from Mahuva constituency in Bhavnagar district against the "anti-farmer and anti-poor" BJP. "I have not officially resigned from AAP. I have told the party leadership that I am contesting independently from Mahuva. They told me to do whatever I feel right. For now, I am not a member of AAP and I will not be working for it during this election," Mr Kalsaria, a three-time BJP MLA, said. AAP has so far declared candidates for 20 seats. Mr Kalsaria's name did not figure in the list. Mr Kalsaria said he filed his nomination as an independent candidate yesterday and will fight the elections under the banner of Sadbhavna Manch, an outfit of Sadbhavna Charitable Trust. Mr Kalsaria had parted ways with the ruling BJP after successfully spearheading farmers' agitation against Nirma Group's proposed cement plant in Bhavnagar district in 2011. In 2012, he contested the state elections as an independent candidate, but could not win. In 2014, Mr Kalsaria joined the Aam Aadmi Party (AAP). "People from this (Mahuva) constituency remember my work as an MLA. We built two charitable hospitals under our Sadbhavna Charitable Trust, and we also constructed water bodies. They were not happy that I had left this constituency, so on their insistence I have decided to again contest from here," Mr Kalsaria said. He said his fight was against the ruling BJP and not against AAP or Congress. "I could have contested from AAP. I am not angry with BJP, Congress or AAP. There are good people in all the parties. But there are certain policies of the BJP that I oppose. I am against the BJP's policies for farmers and poor. My fight is against the anti-farmer and anti-poor policies of BJP," he said. Mr Kalsaria had recently met Congress vice president Rahul Gandhi during one of his campaign tours in the state, raising speculations that he was likely to join the Congress. Mr Kalsaria said he had expressed his desire to contest as an independent candidate and had sought Congress' backing. "I had requested Rahulji not to field any Congress candidate from Mahuva constituency. Congress is a big national party and is free to field its candidate from Mahuva," he said. Congress is yet to announce its list of candidates for the elections for the 182-member Gujarat Assembly to be held on December 9 and 14. The results will be out on December 18.